Janel Tupuola was beaten to death with the stock of a shotgun allegedly wielded by her ex-boyfriend, who was charged in Wednesday's attack. Above, a photo of Tupuola is held by a family member. I am starting a "victim clock." 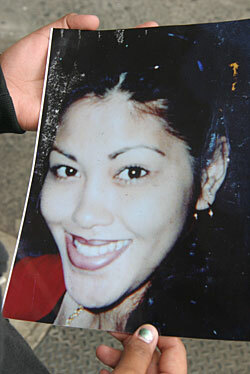 Janel Tupuola is the first tick, the first Hawaii victim for 2008 I know of whose death was preventable if any of the witnesses to her brutal murder had been properly trained and had a personal defense firearm available. What other option could have stopped her attacker? I'm holding responsible all of the anti-gun police leaders, politicians, our state attorney general, newspaper editors, women's rights advocates and a large number of our citizens who support even more restrictions on private ownership of firearms and discourage responsible civilians from acquiring them. Even the Honolulu prosecutor Peter Carlisle has admitted that lethal force could have been justified in Tupuola's case. Must be an election year, because Carlisle invariably testifies vociferously against bills that would overcome the failure of the county police chiefs to issue any concealed carry permits to civilians under any circumstances. Too bad Janel couldn't have a permit for a car gun. She certainly needed one. There's going to be a frenzy of blame following the horrific acts of violence in the past days. The blame will come from the usual suspects. These events just show the glaring problems in the state. Systems to address domestic violence are antiquated. Mental health services are draconian. Our politicians are more concerned about University of Hawaii football than about addressing the problems faced by the disenfranchised and the poor. Something is wrong when the almighty dollar and sports take precedence over protecting ohana and addressing a broken system that treats the mentally ill. Leadership needs to be comprehensive with long-ranged solutions. Not the politically correct and Band-aid fixes. Neglect is the culprit. UH's athletic woes have been 30 years in the making. If you think the athletic department is bad, try sitting in the old lecture halls and the moldy library. If the Legislature and Gov. Linda Lingle continue to be reactive, we're doomed to wallow in this mess for years to come. We elected you to lead -- LEAD! Recent letters to the editor remind us of how government easily avoids serious thought in favor of pandering to environmentalists whose science is based upon something Merlin conjured up in his pot of wishful thinking. Plastic bags might live forever in any environment except fire. In fire, they shrivel up and fly away, forgotten, faster than hyperbole from the Legislature. Hawaiian Airlines might escape yet! Kudos to the pilots union for putting up an impasse against Hawaiian Airlines' attempt to buy $4.4 billion worth of European aircraft. We don't really know the real reason why the pilots are doing this. But it gives a way out for Hawaiian Airlines to get out of a totally un-American attitude in its thinking and business acumen. Hawaiian Airlines -- buy American! Here we are starting a new year, an election year, which looks to be yet another that will be rife with election-year promises. Every media report that I've watched, read or heard tells me that voters want change, as they lay blame upon our elected officials of both political parties and at all levels of government. I am concerned about Hawaiian issues, particularly those that deal with exchanging or awarding ridiculously low lease rents of lands for which Hawaiians will see little or no benefit. Where are our Office of Hawaiian Affairs leaders, and why aren't they questioning such sweetheart deals on behalf of their beneficiaries? OHA was created to benefit Hawaiians and to advocate for the best interests of its beneficiaries. Upon OHA's formation, trustees' pay was based on the number of meetings they attended -- and they held many meetings back then. Today, they're paid the same, if not better, than our state legislators, with all the same benefits. These folks need to start addressing the needs of and the issues that affect all of the beneficiaries for whom they were elected to advocate. I sense that change is in the air, and as far as OHA is concerned, I'm voting for change in 2008. The recent court ruling in Wisconsin to take public monies away from so-called "virtual schools" is a mistake. I have had it with government and courts telling us how to live our lives and demanding that we pay our taxes whether we like their decisions or not. I think "virtual schools" would save the taxpayers plenty of money. Here in Hawaii, our Department of Education spends billions of tax dollars each year teaching us what it wants us to believe. Under the current system, we taxpayers pay for teachers, principals, groundskeepers, custodians, school buildings, subsidized meals, school maintenance, land for new schools, new school buildings and all sorts of administrative costs. If these "virtual schools" could accomplish the same education as in the more traditional little red schoolhouse education and save the taxpayer money, then what is the matter? Thursday's story about surfing sites planned for elimination at Kahului Harbor on Maui really upset me. I live in Long Beach by the Port of Long Beach and the Port of Los Angeles. We (Surfrider Foundation) are trying to lobby to have the breakwater taken down. It was built for World War II but still remains and is the reason for water not circulating, creating polluted water, and it destroyed a world-class surf spot. Don't let this happen or the long-term repercussions will be monumental. Maximizing profits, regardless of social effects on the community, seems to be the guiding principle of Kaneohe Ranch. Mitch D'Olier's statement ("Another View," Jan. 6) that the Kailuan apartment complex was never intended to be "affordable housing" is on a par with the company's policies he represents. Kailua lost more than 180 needed affordable units when Kaneohe Ranch sold the land under these units to Schuler Homes for the construction of upscale condominiums. Then, as now, the company used an EPA requirement under the Clean Water Act as a convenient tool to serve its own interests. Eviction was never the intent of the EPA. As to the relocation assistance offered by Kaneohe Ranch, how far does $10,000 go in our housing market? And is it not patronizing and wrong for a wealthy landowner to try to assuage its conscience by unloading its problems on an already overburdened charitable organization such as Catholic Charities? As we all know, events in life sometimes bring us to places we never intended to be. And often the new circumstances, which might go counter to past history and policies, confront us not only with challenges but also present us with opportunities to do the right thing. We do not need upscale condos. What we need is to salvage the small vestiges of homes ordinary working people can afford. Kailua has fed the financial appetite of the Kaneohe Ranch Company extremely well. Have we not earned a little aloha and fairness? Why not accept the good offer by the Kailuan unit owners to purchase the land under their feet? Why not do the right thing and preserve some affordable units -- even though this might never have been Kaneohe Ranch Co./Castle Family LLC's intended plan for the Kailuan? Editor's note: Gen. Georges H. Sada was the commander of the Iraqi Air Force under Saddam Hussein. He sided with the U.S.-led coalition after the 2003 invasion of Iraq, and is the author of the book "Saddam's Secrets: How an Iraqi General Defied and Survived Saddam Hussein." He will be speaking at 6 p.m. today at Word of Life Christian Center, 544 Queen Street in Honolulu. The following is his letter to Maj. Gen. Benjamin R. Mixon of Schofield Barracks. I want to express my gratitude for the opportunity to meet and share experiences and goals in freeing Iraq from an oppressive dictator's regime. It was a privilege to communicate my observations on what my country has gone through and needs in the future. The millions of good Iraqis will never forget the sacrifices of America that have freed them from tyranny, a cruel dictator and a world danger. I want to salute the brave men and women who serve here, and in Iraq, and who have sacrificed much for a country so far away! I want to bow in respect for the fathers and mothers who have also sacrificed much to send their sons and daughters into this fight. My belief is that the Americans have done an excellent job and now it is time for Iraqis to complete the details that will create a stable and lasting peace in our country. Terrorists have openly declared war against goodness and civilization; therefore, it is clear that we face an ongoing and serious battle between evil and good. We cannot afford to only be observers -- we must choose good and continue to stand for it. The security and safety of America should never be politicized. And all Americans, whatever they believe, should always back their troops who are the lifeline to freedom worldwide. With great conviction, I believe we will be victorious as we serve together. We are truly brothers for truth and freedom. God bless America and Iraq. Ron Kozuma, the president of the Hawaii Teamsters, derides Times Supermarkets for lack of ohana because they refuse to acquiesce to his union's unreasonable demands. His constituents should be furious that he has led them down such a perilous path. Even in a state where there is a pervasive sense of entitlement, the demands of the Teamsters that Times pay unlimited medical premiums for employees who voluntarily choose to take a leave of absence is just ludicrous. I feel no sympathy for those who chose to strike and lost their jobs. The piper played and they followed blindly to their own demise.